WeatherTech Side Window Deflectors are precision-machined to perfectly fit your 2014 Toyota Prius's window channel. These low profile window deflectors help to reduce wind noise and allow interior heat to escape. 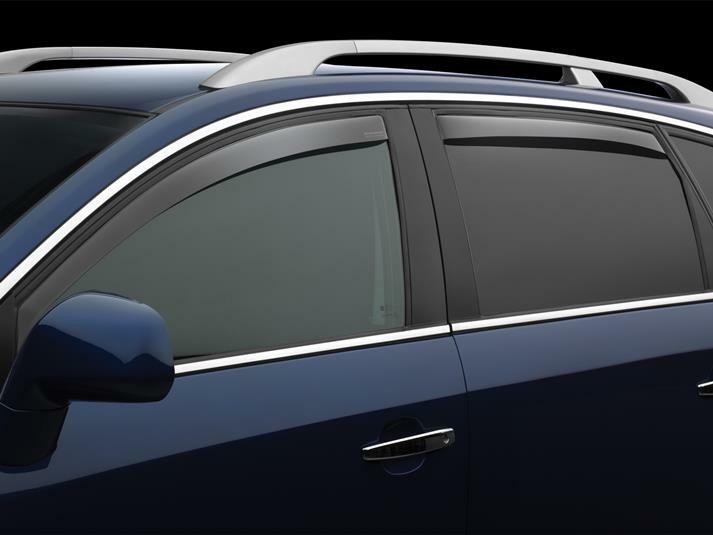 Our light tinted Side Window Deflectors are the only deflectors in the world made with a D.O.T. (U.S. Department of Transportation) approved glazing material. Available in light and dark tint for most vehicles. Designed and Engineered in USA – Handcrafted in Germany. I like the deflectors and love WeatherTech as a company. The front ones installed easily. I had trouble with the rear ones. Resulted in the deflectors being chipped and cracked multiple times. WeatherTech was kind enough to replace them under warranty. Then I took the easy way and had the dealer install them. If I were to do it again I'd take the advise of others and install the clips after putting the deflector in the track. I checked with your web site to see if you made window deflectors to fit the 2009 Prius before I purchased my new vehicle. PS: The sticky stuff on the rear window deflectors came loose and let the deflectors rattle when the rear windows were down. I had to glue the front ends in with contact cement. It's still holding, so far. I ordered these deflectors for both of my 2007 Prius'. I made an attempt to install the rear deflectors according to the instructions and found it very difficult. I found it much easier to install the deflectors first and then work the rubber window channel down with the supplied tool and install the metal clips last. It's a little tight getting the seals down with the deflectors already in place, but it can be done. Then I used a flat screwdriver to push the clips all the way up into the channel. Very simple and clean installation.